Anthony Boyd received a belated Christmas present on Monday morning in the form of a phone call from Flemington trainer Tommy Hughes. Hughes was hoping to engage a three-kilogram claiming apprentice to partner his promising pair Gold Cufflinks and Mister Miyagi at William Hill Park (Sandown) on Wednesday. It took Boyd (a 29-year-old first-year apprentice) less than a millisecond to accept the opportunity. The Hughes-trained pair will provide the young rider the chance to achieve a life-long dream and make his metropolitan race riding debut. Few apprentices have taken as dramatic a path to success as Boyd. 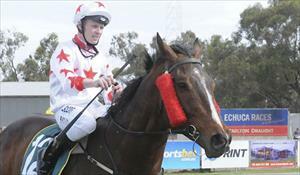 "Two years ago, if you had told me I’d be riding at Sandown I would have laughed," he said. "I was 78 kilograms, a track rider and basically raising two kids on a track rider wage, so things were pretty tough. "I’d have never dreamt of having my first ride at Sandown a couple of years down the track - I thought that opportunity had well-and-truly passed me by." A swift reality check courtesy of a home video — coupled with the constant support of his wife, and his employer, trainer Danny O’Brien — inspired the father of two to lose a bit of weight. That bit turned into a lot, and within a matter of months, Boyd stripped down to a lean 52 kilograms. His transformation reinvigorated his life and career. On Wednesday Boyd will make his metropolitan debut alongside the likes of Damien Oliver, Dwayne Dunn and Mark Zahra, and said his decade-long stint as a track rider had prepared him for what otherwise would have been an overwhelming occasion. "It’ll be great. Just to ride work with them was a big thing, and I’ve always had a lot of respect for them," he said. "I’ve ridden with them for the past 10 years at Flemington and have built some really good relationships over that time. As for his mission on Wednesday, Boyd will walk into the jockeys’ rooms with an air of confidence. Mister Miyagi put in a much-improved effort at William Hill Park (Lakeside) last-time out and Gold Cufflinks, though drawn wide, will improve second-up from a freshen-up. However Boyd has one clear goal for his first race ride. "The main aim there will be to beat the master’s horse home if I can, Skulduggery,” Boyd said with a laugh. "His horse goes well, but from barrier one it looks like I should get an ideal run on Mister Miyagi and hopefully I’ll be finishing over the top of them."